'I'm excited about working with seaweed in my restaurant kitchens. We cook a lot with seaweed harvested from the Cantabria coast. Something I like to do is cook fish in hot salt and seaweed. I take a piece of seaweed, lay it on a hot stone, then place a layer of salt over the top. Upon that you lay the fish, add more salt then a second piece of seaweed to form a kind of parcel. The salt should be heated in a pan before it cocoons the fish in order to allow the dish to cook. From the hot stone, heat travels evenly throughout the layers and the fish is ready in just two minutes. The dish is taken out to the table still wrapped up, then undressed in front of the diner as it is served. Nacho Manzano is executive head chef of the Ibérica group and the two-Michelin-star restaurant Casa Marcial in the region of Asturias in Northwest Spain. 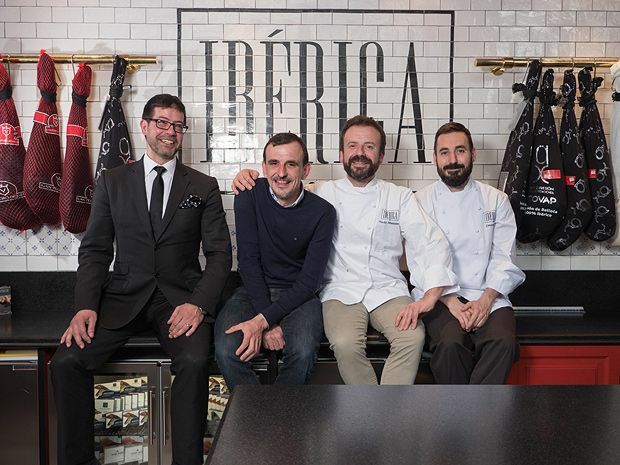 Iberica Glasgow opened in Glasgow in October 2016. An upmarket, sophisticated city centre restaurant and deli with beautifully prepared dishes from Northern Spain.